If your nightly glass of wine has resulted in a collection of bottles just waiting to get crafted into something new, this project is for you. Creating eco-friendly items out of recycled materials can be tricky if you want something functional as well as aesthetically pleasing. As much as we love giving new life to materials we’d otherwise just throw out, we also don’t want our backyards and patios to look like a trash can. 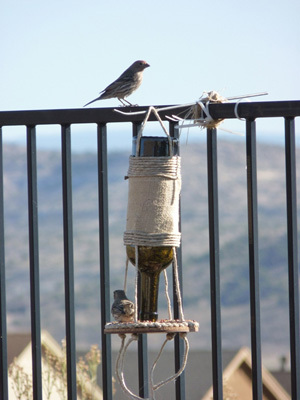 This project gives you the best of both worlds — a great way to recycle old bottles and a cute bird feeder that you’ll be proud to hang in your yard. 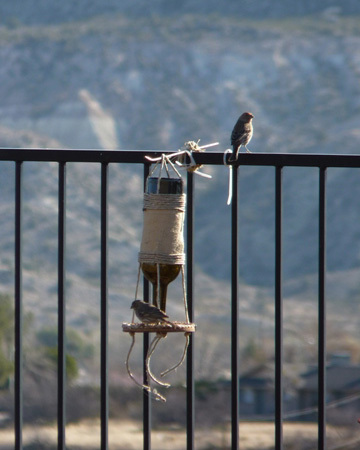 Plus, it will make the birds think they are at happy hour, making your feeder the best one on the block. Clean and dry your wine bottle thoroughly. (Labels can be removed by soaking the bottle in warm soapy water for a few minutes — but you’ll cover the label anyway, so no need to remove it.) Then gather all your supplies and you’re ready to start! 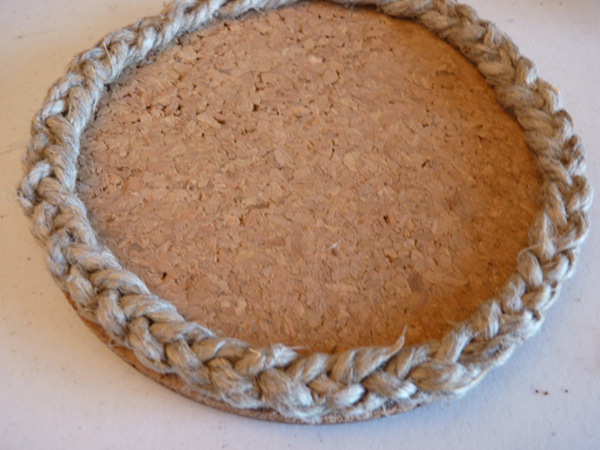 Measure a piece of twine about an inch longer than the circumference of your cork disc. Cut two more pieces the same length. Hold the three pieces together and put a dab of hot glue on the end of the twine to hold it together. Braid the three pieces and finish by putting a dab of hot glue on the end. Glue the braid to the edge of the disc. This will help keep the bird seed on the disc instead of falling all over the ground. 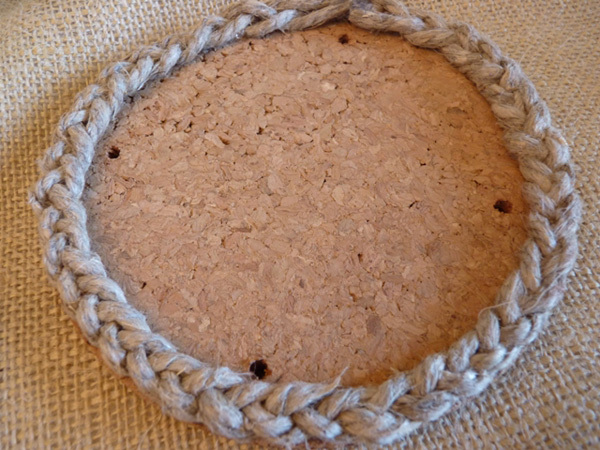 Drill four small holes in the cork disc, just inside the twine braid. 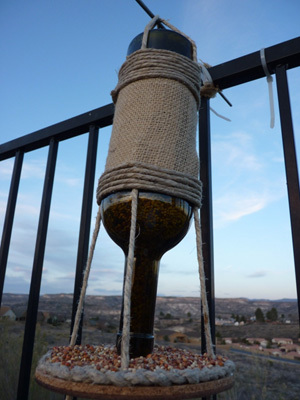 Cut two more strips of twine about 10 to 12 inches long; hot-glue the ends on four points around the bottom, about a third of the way down the bottle, to create a way to hang the feeder. 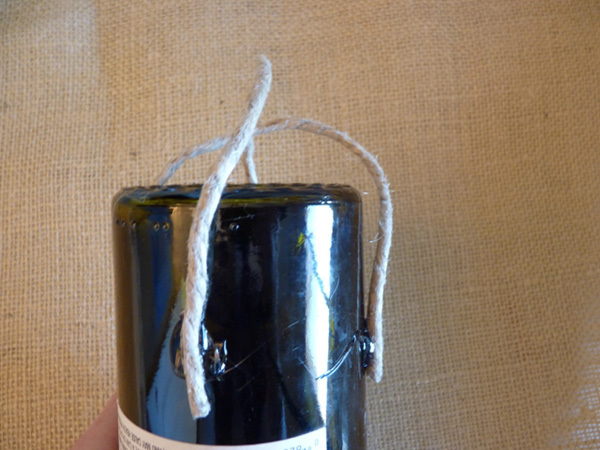 Cut four more long pieces of twine and glue them about a third of the way up the bottle, hanging down towards the neck. The length will depend on how long the neck of the bottle is — it’s better to overestimate the length and then trim any excess when you are finished. You’ll use these to attach the bottle to the cork disc. 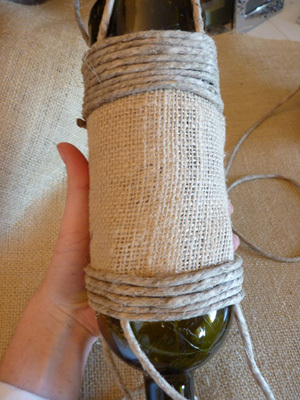 Hot-glue the burlap or other fabric around the bottle, being sure to cover all ends of the twine — this will ensure a tight hold. 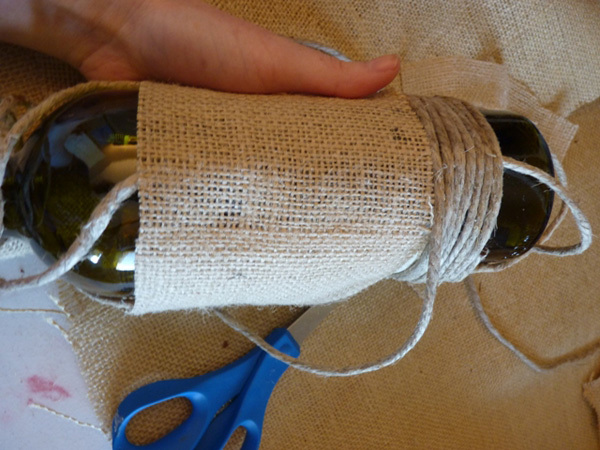 Wrap the twine and glue around the top and bottom of the fabric again to secure both the twine you will use to hang it and the twine that will hold the cork disc. 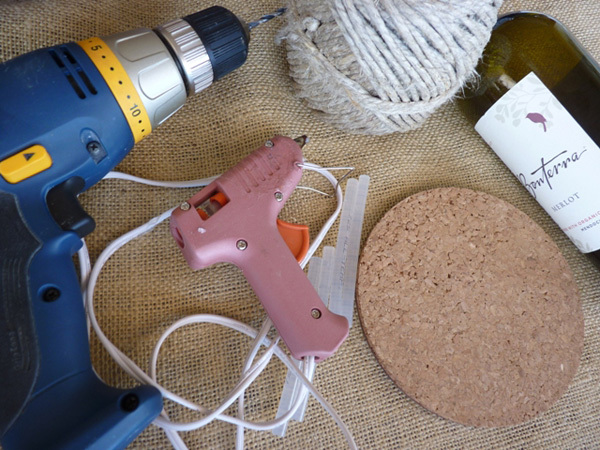 Thread the four pieces of twine hanging down past the bottle neck through the drilled holes in the cork disc. The bottle should be just slightly above the disc — this will allow seed to come out without spilling all over the place. Tie knots at the end of each piece of twine to secure them. Move the cork disc out of the way and turn the bottle upright. 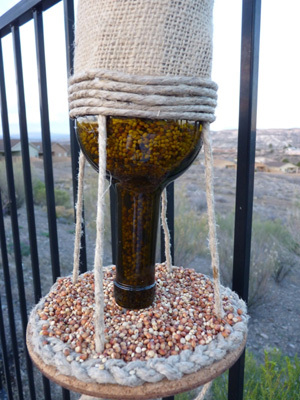 Fill the bottle with birdseed using a funnel. Carefully flip the bottle over, with the neck on the cork disc, and hang it up.